The Loupe Desktop is the heart of the Loupe system, providing the ability to analyze sessions from multiple applications and understand both the small picture of a single customer problem and the big picture of the reliability and performance trends of your application. The Loupe Desktop is the only licensed part of the Loupe system, allowing you to freely distribute the agent and collect as much information as you want without any royalties or other fees. The start page is dynamic, adjusting its display based on the data present on the local computer, so it may display differently than the image above. View Local Sessions: If you want to view the details of a session that was run on the local computer it may be listed in the New Sessions section (if it was just recently exited) otherwise you can find it in the All Sessions node under Local Sessions. For more information, see Loupe Desktop - Local Sessions. 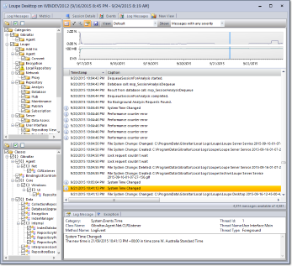 Go Back to a Recent Session: The last five sessions you viewed on the local computer, either from the Local Sessions or User Repository, are listed. This list doesn't include sessions that were viewed directly from a Loupe Log Package. Open a Log Package: Open an existing Loupe Log Package (GLP) file on disk. GLP files can be stored anywhere, including on a network share. The log file is locked the entire time you have it opened, preventing other users from making changes at the same time. For more information, see Reference - Package Repositories. Once you've found a session you want to drill into, it can open into its own Session Viewer. 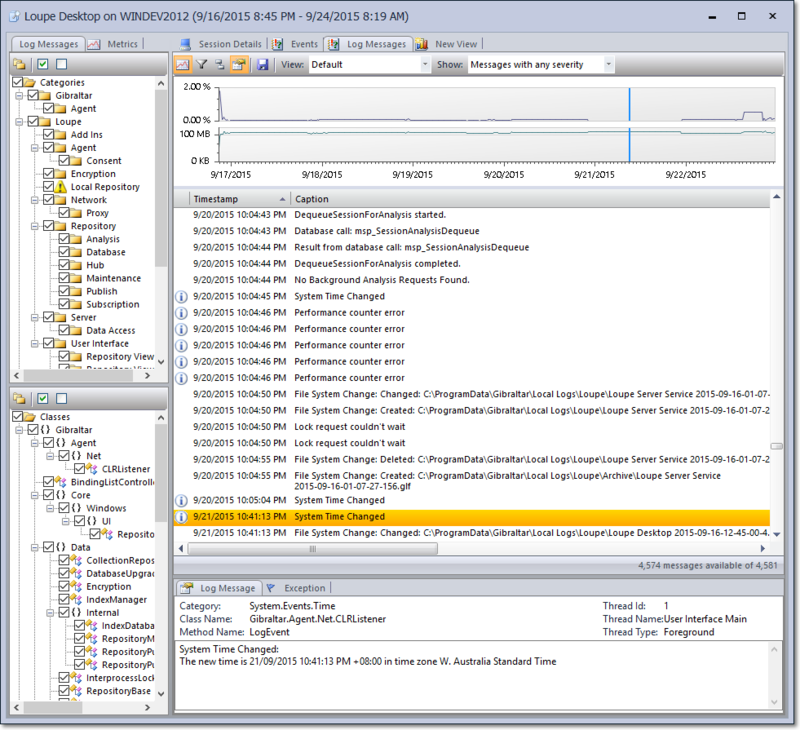 The session viewer exposes every piece of information on the selected session, providing integrated means of relating the log messages, performance metrics, session overview, and other items together. The view can be extensively customized to show more or less information. If you want to compare two sessions, open both up and place their windows side by side. 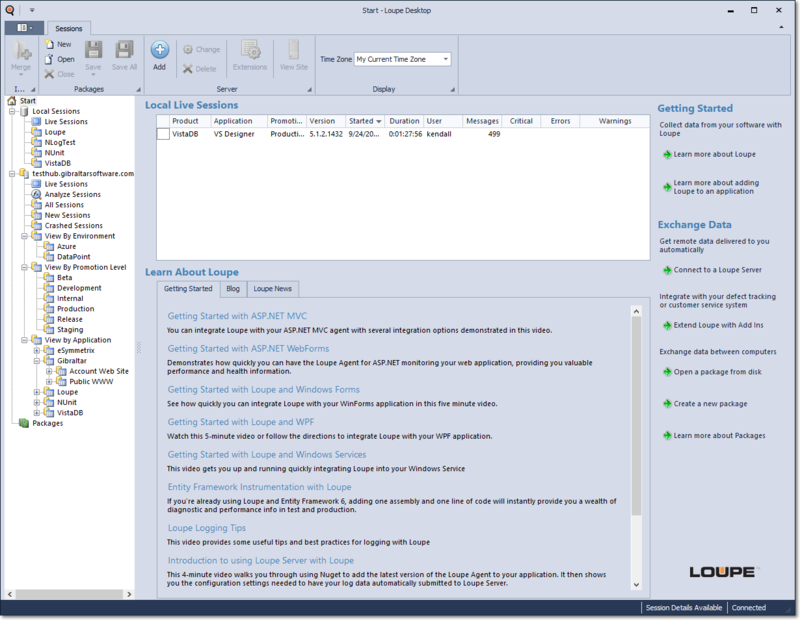 For more information, see Loupe Desktop - Session Viewer Introduction.